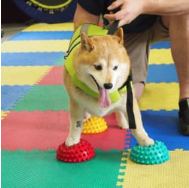 Physical therapy is another method of strengthening and conditioning available to our veterinary patients. Through a specific routine of exercises and stretches, patients are able to strengthen muscle tone which can help to alleviate pain associated with arthritis and other ailments. This can be specifically beneficial in patients recovering from surgery or an injury.